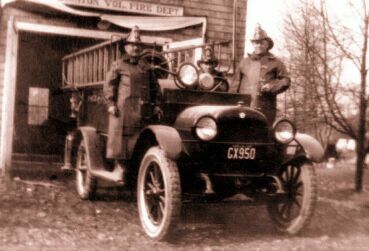 The Livingston Fire Department was formed in November 1921 following a meeting of the Livingston Gun Club. The town was extremely rural at the time and did not have an organized form of fighting fires. Buckets and wells offered the only true water supply for protection. There was little money to spend on equipment, so the first months were spent discussing what could be done to provide fire protection. Eventually twelve fire extinguishers were purchased, which were picked up by the members when there was a fire. The town installed eighteen large metal rings, which were placed throughout the town. When a fire was detected, residents would go to the nearest ring and begin hitting it with a hammer. This would alert others to do the same, hitting the rings until firefighters could hear them. In 1923 the Township Committee allotted $3,500 to the department. The men took the money and purchased a Reo Chassis and mounted a horse drawn chemical truck, which was loaned to them by the Newark Fire Department. The departement’s first engine would be forever known as “Mary Ann.” Soon after a wooden fire house was built on donated property in Livingston Center where today’s fire headquarters still stands. Getting the department’s next engine would not be so easy. The controversy led to the Chief (Hockenjos), the President and seventeen other members resigning. The department received the1928 Mack and painted it white, earning its historical name, “Snow White.” A new masonary headquarters building was constructed in 1929 where the old one stood. This building, with major alterations and additions still serves as fire headquarters today. In 1933 the township purchased a Packard automobile, which the men altered by welding on cabinets for equipment. This vehicle was the first Rescue Company in the area. In 1935 the department received delivery of its third engine, a Ford pumper. At about this time, the town installed a siren alerting system for firefighters. Sirens were located throughout the town with an alarm box in police headquarters. The system had a number of round metal rings, each with a different of teeth. Each ring would result in a different series of siren sounds, much like Morse Code. The different patterns would not only alert firefighters to a fire, but the codes actually instructed them which part of town to respond to. The system did not work as well as originally thought and was replaced with an air-horn system in 1946. In 1937 the department purchased a LaSalle ambulance to provide emergency medical care and transportation to residents. The department would handle such calls until 1950 when members of the fire department voted to give the LaSalle and $250 to the newly formed Livingston First Aid Squad made up of 25 firefighters. The first aid squad still operates today and can be found at here. 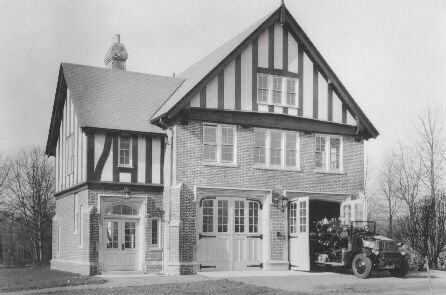 Construction of the department’s second fire house, the Northfield Station was completed in 1952. During construction the department acquired another engine, a 1949 Mack, which was temporarily housed in a bay at Merrigan’s Northfield Esso, now the Shell station next to the old Sam’s Department store building at Northfield Center. By this time the 1933 Packard Rescue was feeling the effects of age and the department purchased a 1952 Dodge Power Wagon Rescue Truck. In 1955 the department acquired another engine, a Mack as the township continued to grow. The engine was known as “Sweet Pea.” Around this time “fire bells” were installed in each firefighter’s home. The bells would activate with the sirens and air-horns, ensuring quick notification and response. A short time later in 1957 the Circle Station at the Livingston traffic circle was completed. By 1960 the department added two more engines, a 1959 Mack and a 1960 International. 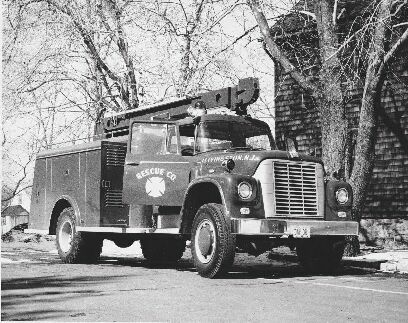 In 1963 the department took delivery of its third rescue vehicle, an International truck equipped with a hydraulic winch and boom. A major addition to fire headquarters was completed in 1965, adding three equipment bays, offices, and a squad room to the building constructed in 1929. Major additions were also completed on the Northfield Station in 1967 and 1970. In the late sixties and early seventies the township continued to grow with major commercial buildings being completed. St. Barnabas Medical Center was completed and the Livingston Mall opened and is still the town’s largest structure. This in part prompted the purchase of the department’s first aerial appartus, a 1974 Mack 85-foot Snorkel. By 1975 the department was averaging more than a thousand runs per year. Equipment upgrades continued in 1976 when the department installed its first set of hydraulic Hurst Jaws of Life on the rescue truck. In 1977 a Self Contained Breathing Apparatus (SCBA) refill system was installed at fire headquarters. Several years later in 1981, a new Mack 1250 GPM engine was put in service at fire headquarters. In November 1982 the department responded to perhaps its most unusal call when two small planes collided in midair over Manor Rd and Demarest Dr. Both planes plummetted to the ground, killing the two pilots and one passenger. Miraculously both planes landed in grassy areas of two residences, which were not damaged and fortunately there were no injuries on the ground. The departments first Annual Open House during Fire Prevention week was held in October 1985 in conjunction with the First Aid Squad. The event was designed to allow the township’s residents to view the department’s apparatus and learn about fire safety. The event was also used as a fund raiser for the St. Barnabas Burn Foundation. The event is still held each year and continues to raid money for the burn foundation. Progress continued in 1986 when a large addition was constructed at the Northfield Station in anticipation of the arrival of the new rescue truck due to be put in service in 1987. The new rescue truck, a 1987 Mack was the department’s fourth rescue vehicle and came complete with hydraulic boom, winch systems, scene lighting, two sets of hydraulic jaws and cutters, and many other tools. The new truck was joined by a new Mack enging, which arrived and was assigned to the Northfield Station in 1989. 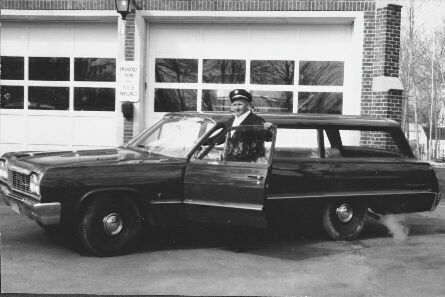 In 1990 Chief Charles Schilling retired after 36 years as chief. Chief Schilling served with the fire department until 2014 and the first aid squad (where he is a charter member) until 2015. Chief Schilling retired from the Livingston Township Building Department on January 31, 2019 at the age of 97 where he served as a Code Enforcement Officer. Chief Craig Dufford took over in 1990 when Schilling retired as chief and served as until his retirment in 2003. Chief Dufford remains and active member of the fire department and first aid squad and is now a fire inspector for the department. Chief Christopher Mullin took the helm in July 2003 and continues in the role today. The department’s round “Ever Alert” insigna used for decades was changed in 1991 to the more recongnizable Maltese cross. The original design was incorporated in the new insignia as the center circle of the Maltese cross. Soon after the department purchsed its first enclosed cab engine. The new 1992 Mack replaced a 1977 Mack stationed at the Circle Station. In 1996 the department celebrated its’ 75th Anniversary. A huge celebration was planned to coincide with the delivery of the second enclosed cab engine, a 1996 Mack. Although the event was well planned and one to remember, the new Mack was not delivered in time. The show had to go on and the 1992 Mack was polished and filled in for the missing one. Not all coule be fooled, but enough were and the celebration went ahead. The new engine did eventually arrive. The Insurance Service Office also came to town in 1996. Following an in-depth inspection, Livingston’s classification was changed from a Class 4 to a Class 3. This change was the result of many hours of work upgrading equipment and training of personnel. Just prior to September 11, 2001 the department took deliverey of its second aerial piece, a 93-foot American LaFrance Ladder Tower. Just days ahead after the wetdown, the terrorist attacks of 9/11 shocked the world. In the aftermath that followed, the department’s rescue truck covered mutual aid assignments for FDNY’s Rescue 5, based at the Clove Street Station on Staten Island. Rescue 5 had responded to the World Trade Center that day, losing 11 of 12 men that responded. Engine 5 from the Circle Station also covered FDNY as they worked at Ground Zero, answering calls from the Watkins Street Station in the Brownsville Section of Brooklyn. 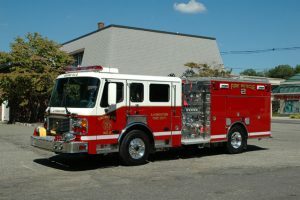 In September 2005 the department placed in service a 2005 American LaFrance pumper. A photo of Engine 2, a resuce pumper with a 40Kw Generator, on board Hydraulic Hurt Jaws and cutters, as well as 500 gallons of water and a 40 gallon Foam tank. In October 2005 the Fire Department and First Aid Squad members decided it was time to redesign the Center Island that sits between the Fire Department and First Aid Squad buildings. The two organizations presidents (Thomas Cooney LFD and Craig Melhorn LFAS) created special committees within their organizations to work together on the project. The two committees began fomring ideas as to how the Center Island should be resdesigned. The idea was to create an area that could be viewed from Livingston Ave with Memorials dedicated to each departments members visible from the parking lot. After countless hours and meetings, a design was formulated with the help of a local landscaping company and plans were drawn up. Since Livingston Ave was being completely redone by the Business Improvement District (BID) our plans were revewed with them for concurrence. The new Center Island was completed on May 26, 2006 and now stands as a testament to these departments tradition and dedication to their community. As the Livingston Fire Department closes in on it’s 100th Anniversay in 2021 president Tom Cooney has formed a committee to begin updating information, including this page with the history over the last 10-15 years. Much has changed in Livingston and within the department and we look forward to continuing to tell the story here on our website.